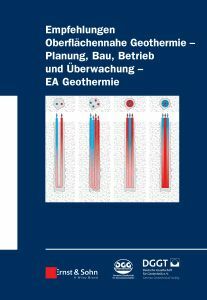 About 30,000 geothermal plants are installed in Germany each year. There are no uniform regulations for their design, construction and operation. The specialist and approval authorities can base their work on the recommendations. The study group Geothermie is a joint study group working since March 2007. Its members are of the section Hydrology of the Deutsche Geologischen Geselschaft - Geologische Vereinigung e.V. (DGGV, formerly DGG) and the section Ingenieurgeologie of the Deutsche Gesellschaft für Geotechnik e.V. (DGGT) and the DGGV. Deutsche Gesellschaft für Geotechnik e.V. / Deutsche Gesellschaft für Geowissenschaften e.V.